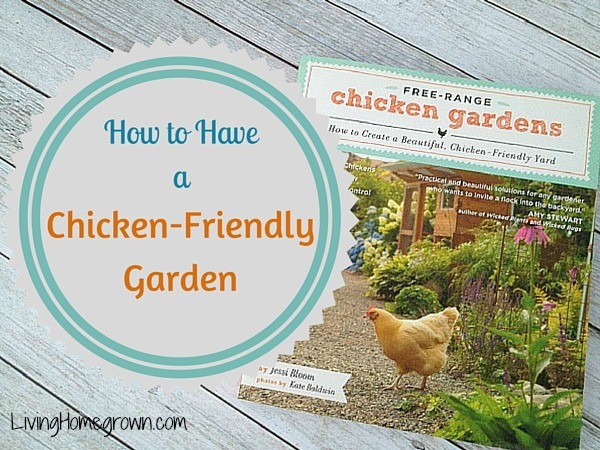 There is a common notion that you can’t have backyard chickens in the city AND a garden too. And this is true if you just let your chickens loose in your backyard without any forethought. But when done right, chickens not only bring entertainment, they also become workers in your garden so you can reap the benefits! 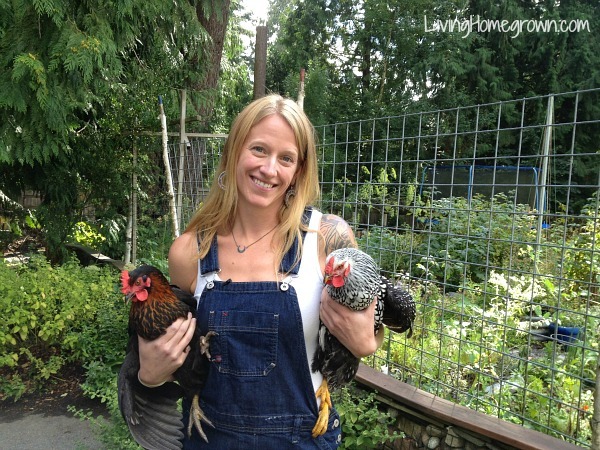 This post is a summary of my recent podcast interview with Jessi Bloom – the author of the book: Free Range Chicken Gardens*. Jessi is not only an author, she is also an award-winning ecological landscape designer, certified arborist and the owner of the landscape company Northwest Bloom near Seattle, Washington. Jessi and I chatted about how it is possible to create a habitat for your chickens in your own backyard. And about how you can merge those two worlds (chickens AND gardens) so they are happy being chickens AND you still have your own outdoor space. First…Why would you want to let your chicken’s free range in the first place? Well there are a lot of perks (to both you and the chickens). Unfortunately if you keep them locked up in a coop you’re never going to experience those perks! Happiness: They are happier being chickens if they are not in a cage all day. This doesn’t mean you need to let them out 24/7 (in fact, you DO need to protect them at night). It just means they do best when they get to run around, explore and just be chickens in an open space for at least part of each day. Less Pests: If your chickens free-range, they are taking care of pests for you. They are the perfect partners for organic gardeners. You don’t need to spray – just let them eat the garden pests. Weed Control: They make excellent weeders! Let them loose in an area that needs a little weed control and they will clear that space right up for you. Just be sure you protect any seedlings (they don’t know the difference) or small plants that are off limits. You can use fencing or a chicken tractor to section off areas you want to protect. Free Fertilizer: They feed your garden soil while they work. Chicken manure is fantastic and they are dropping it around the garden and then scratching it into the soil as they go. Note: If you clean out your coop, you have concentrated amounts of manure in that bedding. It’s important to know though that straight chicken manure is extremely high in nitrogen and it can burn your plants if applied directly. If you have straight manure (or bedding), you need to compost it first or let it sit a couple of months before applying it. Keep in mind that your chickens will wander around and self fertilize as they drop their manure and it’s totally okay. You just don’t want to put super concentrated amounts of fresh manure directly on your plants or they won’t like that. Many people dive into getting chickens (they are adorable after all) and end up bringing home too many for their space. Whatever you do, don’t get TOO many chickens! There’s a term called stocking rate or carrying capacity that looks at how much land you have and how many chickens it can support. If you have too many chickens in a tiny space, those chickens are going to destroy and decimate anything green. Jessi suggests to start with three chickens or five potentially, depending on your city and how many you want to raise. But it is imperative to start small when you raise chickens in your garden. 2) Make sure they have adequate food. If chickens are in a small space with only a few plants, they will eat just those plants. Give them options so they are not forced to eat those plants. One way to do that is to give them access to your compost pile. Another option is having perennial food sources for them rather than annuals. If chickens do eat the perennials, they are going to come back. They’re regenerative (unlike annuals that can be decimated). There will be times when you have seedlings or delicious annuals that you want to protect. Use barriers, bird netting, fencing to keep the chickens away from those plants when you need to. 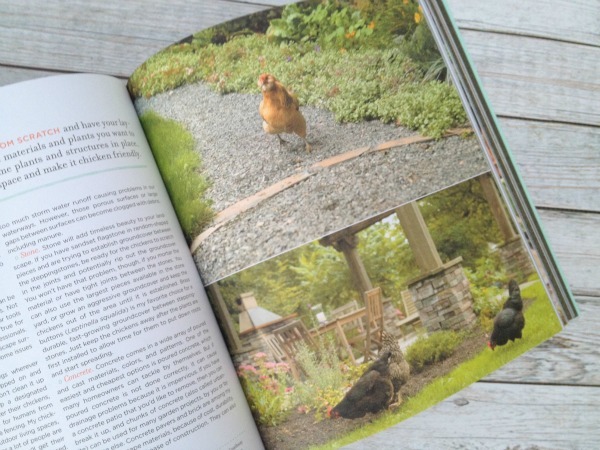 Jessi dives a lot deeper in her book, Free Range Chicken Gardens*. If you want to learn it all, be sure to check it out. It is one of my favorites. Want to Read Every Detail of the Interview? You can listen, download the transcript and get more links over on the podcast episode page.